This site is dedicated to the miniatures, box sets, paint 'n' plays, blister packs, and other related products produced for the Dungeon Dwellers line by Heritage USA. Heritage USA was a miniatures and gaming company that was created by the merger of two companies; Heritage Models (owned by Jim Oden and Cleve Burton) and Custom Cast (owned by Duke Seifried; aka Uncle Duke) in 1977. The Dungeon Dwellers line began production in the later months of 1979 (showing up in dealer catalogs in the winter of 1980), and continued production until the business closed in the summer of 1982. The "Green Box Sets" area has information on all the early Dungeon Dwellers Box Sets; including the miniatures, painting guides, and other items related to the contents of these sets. The "White Box Sets" area has information on all the later produced Dungeon Dwellers Box Sets; including the miniatures, painting guides, and other items related to the contents of these sets. The "Paint'n'Play Sets" area provides information on the gaming kits that Heritage produced for the Dungeon Dwellers line. This includes the miniatures, painting guides, rules, maps, and other items related to the contents of the Paint’n’Play sets. The "Blisters" area deals with all of the blisters packs that were available; this includes the painted, unpainted blister packs, and painted Red Box sets (as they apply to the Dungeon Dwellers line). The "Miniatures" area contains images of all the miniatures that were used in the Dungeon Dwellers line of miniatures. Also in this area are photographs of painted Heritage Dungeon Dwellers miniatures that I have either had commissioned or obtained from other collectors. The "Interviews" area includes a question and answer discussion with many of the people who worked at Heritage back in the day. The current list includes David Helber, Howard Barasch, and Duke Seifried. Lastly, the "Museum" area includes photos from my collection of Dungeon Dwellers figures, artwork, molds, catalogs, and other Heritage USA / Dungeon Dwellers memorabilia. If you have any comments about this site or would like to contribute to the efforts please feel free to Contact Us. Without the help and support of the following people and companies, this site would not be possible. Willard Dennis, David Helber, Max Carr, Steve Bissett, Howard Barasch, Max Nuclear and Duke Seifried. Without your help, friendship, and continued support the data on these pages would not be possible. The owners of Reaper Miniatures, David and Ed Pugh for hosting the yearly Heritage reunions. Without your support, we would have never been able to meet, game, and get to know the "Heritage Gang". Michael Thomas for his help with the unreleased Dungeon Dwellers, and help determining the designation of some of the figures from the molds he owns. Currently, his website is down, but if you are looking for that "one" figure to complete your set contact him. He has been given permission to re-issue some of the Dungeon Dwellers miniatures, and may have what you need. He can be contacted via email or on Facebook. Darron LaFleur, Greg Hamlin, David Erdeljac, Brandon Palmer, Vincent Landt, Adam Pratt, Bryan Merlonghi, Robert Wheeler, Dan Fox, Michael Genet, Shannon Stilz, Vincent Landt, Eric Louchard, and Lyn Stahl. Stefan Poag; for painting the website picture above. 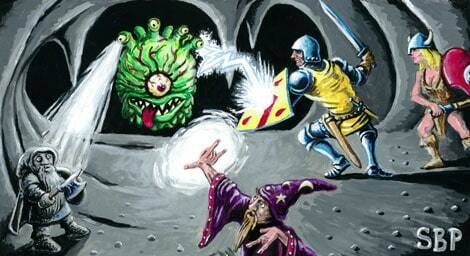 A truly old school encounter, with figures from the Dungeon Dwellers line of miniatures. David T. Wenzel for allowing me to use the images of the white boxes sets on my site. David retains the copyright to the original artwork. Jim Wampler, Chris Sherman, Bill Soucy (the "Dungeon Dwellers Cartel"), Jonny Winters, Mick Leach, Allan T. Grohe, Jr., Frank Weaver, Mike Monaco, Mat Roberts, Russ Herschler (for use of his MoriaCitadel font), and others who either contributed to the site or supported the efforts of "Dungeon-Dwellers.info" through out the years! Lastly, I would like to thank Rick Price, and the late Jamey Price. For those who did not know Jamey, he was the webmaster for the “Digital Dragon”. A website that cataloged, photographed, scanned, and identified figures from various manufacturers. His collection of miniatures was VAST, and after his passing we were able to obtain most of his Heritage collection. To honor and continue his work, this site was started even though it is only one manufacturer, and only one of their lines; Heritage Dungeon Dwellers!!!! August 13, 2017 at 8:22 pm on 3110 Caverns of DoomUpdated... "miniatures included" to include missing dragon wing. August 6, 2017 at 10:46 am on The Dungeon Dwellers MiniaturesContinue adding to the notes. August 6, 2017 at 10:35 am on 3110 Caverns of DoomNeed to add another wing to the "miniatures included in set".